For most parents, their precious little daughter is considered their sweet little princess and they would do anything to make her happy. But where the king fails, there comes a prince to save the day. In modern society, we call this prince our son-in-law. 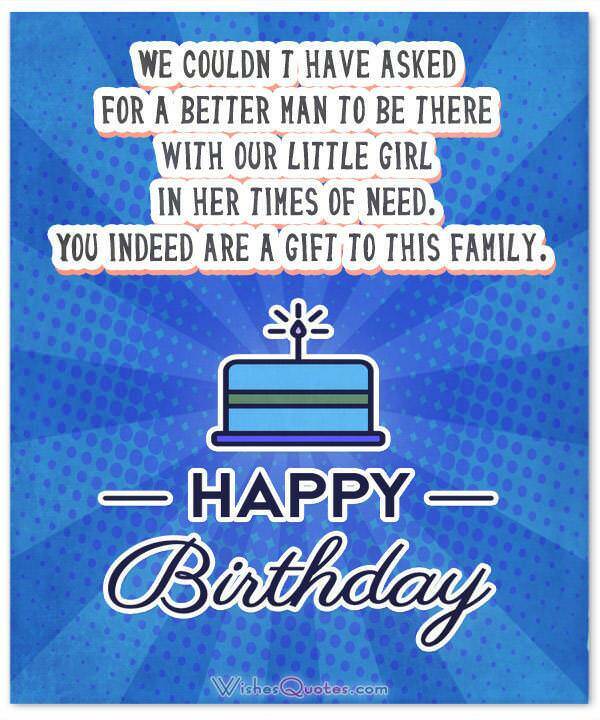 So, to celebrate that exceptional day for both your daughter and her loved one, it is necessary that you give your most heartfelt wishes to your son-in-law to ensure that your feelings get across. But most people have trouble going past a simple “Happy Birthday!” so this is why we are here! 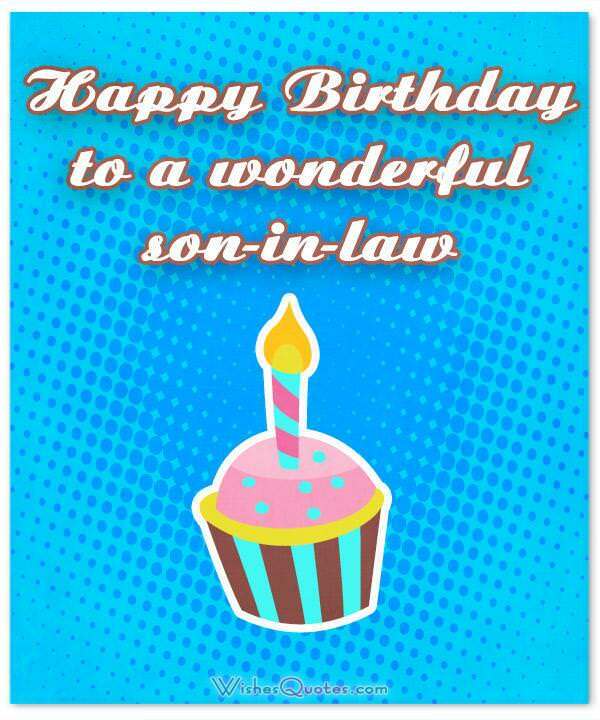 We have provided you with the best wishes on the internet for you to send to your son-in-law! After all these years, the only thing I can say is “thank you.” You made my daughter the happiest person in the world, and you deserve the best in life! Happy Birthday! For you to remain sane after being married to this family for so long, you honestly must be unique! Happy Birthday! You have taken care of our daughter much better than we could all these years. Thank you and happy birthday! We might not be related by blood, but we still love you like our son. Thank you for being there for our little princess. Happy Birthday! We couldn’t have asked for a better man to be there with our little girl in her times of need. You indeed are a gift to this family. Happy Birthday! Our daughter always had a good taste for most things. After meeting you, I think we can add men to the list as well! 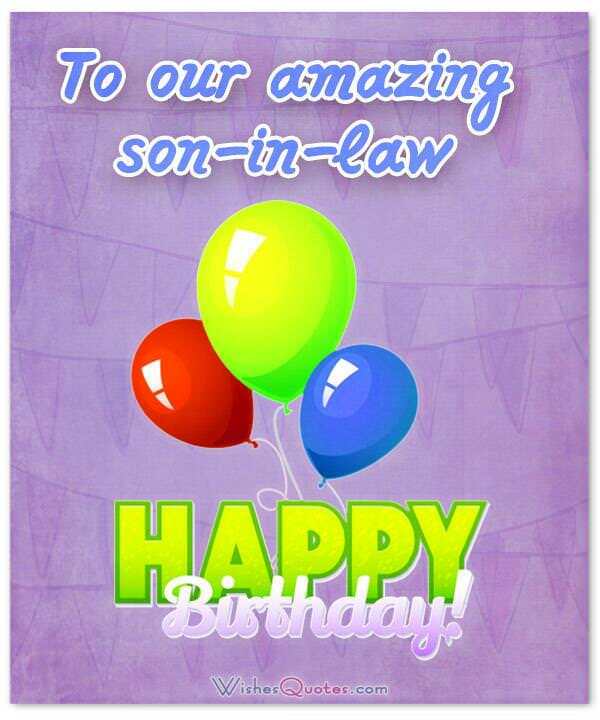 You are the best son-in-law we could have ever wished for. Happy Birthday! You make our pretty little girl feel loved and appreciated. You truly are the reason behind all of her smiles. Thank you and Happy Birthday! All these years we have been raising her, she has never seen her happier than when she is with you. It is your amazing personality that makes her radiate with happiness. So, as her parents, we sincerely thank you. Happy Birthday! 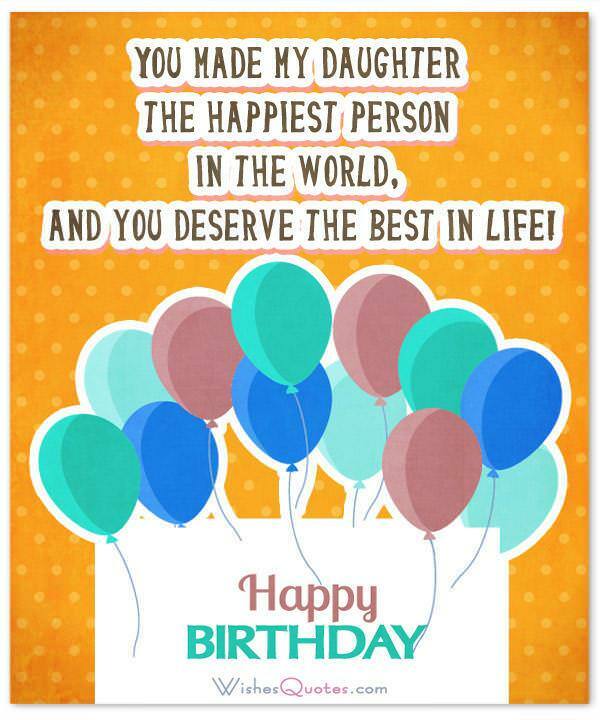 Today is an exceptional day not only for you but for our daughter as well. So, this makes this day important to us. You indeed are a blessing to this family, and we want to say thank you for making our daughter happy. Happy Birthday! When you and our daughter first met, you were mere children. Now, you’ve grown up into something beautiful. So, like your parents, we could not feel any more proud. You indeed are the best couple ever! Happy Birthday! As my daughter was growing up, the only thing I hoped for her was happiness. Ever since she met you, she has been getting much more than just that. You are the best son-in-law a parent could have wished for. Happy Birthday! I know blood does not relate us, but I cannot help myself but feel like you are my son. Since a parent can only feel proud for having such a graceful and amazing young man as a member of their family. Happy Birthday! I never thought that there could be a perfect family until you came into the picture and made our daughter the happiest person ever. Happy Birthday! To be completely honest, I had my doubts about you when I first met you. It only took me a short amount of time to dismiss every single one of them, after getting to know what a fantastic individual you are, I was confident that our daughter would feel loved and secure. Happy Birthday! It is not just our little princess that is lucky for having you as her husband. We feel equally fortunate for being able to call you our son since you are one of the most intelligent, funny and entertaining people we have ever met. Happy Birthday! That was it! Hope you found something that suits you so that you can finally express all these feelings you have. I know that it is not easy to show your most heartfelt emotions on a person that you are not exactly related with, but it is your responsibility as a parent to make sure that you are in good terms with the person that makes your daughter the happiest princess on Earth. I know it’s tough realizing that it is not you, as a parent, that fulfills that role, but you can make everything better by supporting that role from the background. So, I suggest taking that extra time to get a small token of appreciation for your son-in-law, alongside a lovely hand-written card to go along that fancy wish of yours!